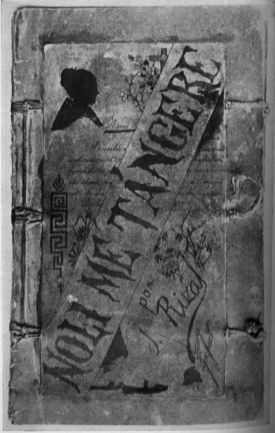 Noli Me Tangere (Touch me not) was written by Dr. Jose Rizal and published in Berlin Germany in 1887. Although a fictional novel, it truthfully portrayed the suffering of Filipinos under the Spanish rule. The book caught the ire of the powerful Spanish Friars who eventually had the book banned in December of the same year. A person caught in possession of the book was in danger of being excommunicated (a penalty far worst than death for the pious Filipinos!). The controversy surrounding the book only fired its popularity. Copies made its way into the country where it secretly circulated among Spaniards and Filipinos alike. Intially sold for three pesos a piece the price soon shot up to a steep twenty to twenty five pesos! The Friars continued their effort to purge the book and criticise Dr. Jose Rizal. They elected Fr. Jose Rodriguez to counter with writings against Noli Me Tangere and Dr. Jose Rizal. In 1889, Fr. Jose Rodriguez published several pamphlets in Spanish CUESTIONES DE SUMO INTERES, and in Tagalog CAINGAT CAYO (Beware). The pamphlet warned that possession and reading of "evil" books was tantamount to committing a mortal sin. It was not long before several pamphlets written to counter the poison words of Fr. Jose Rodriguez began to circulate. 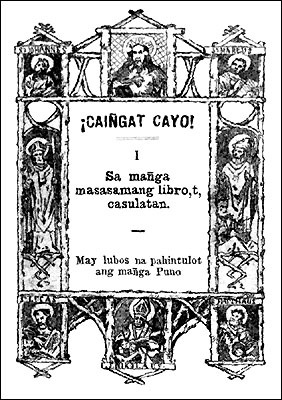 Cleverly guised to look like the original booklet, CAIIGAT CAYO (Be slippery as an eel) was printed under the pen name of Dolores Manapat, Salvadora Liwanag or Dimas Alang which was a pen name often used Rizal. An account in the book "Ang Buhay at mga Ginawa ni Dr. Jose Rizal by Pascual Poblete (1909)" states that on October 4 1888, at the feast of St. Francis of Assisi. The people packed the churches to attend a major mass. When the mass ended, several boys were seen handing out booklets that looked like the pamphlet of Fr. Jose Rodriguez's "Caingat Cayo". A Franciscan Friar peering out from the convent window saw the boys and asked one of the altar boy to procure a copy. The boy obediently run to get a copy and handed it back to the Franciscan friar. To his surprise, the book turned out to be the pamphlet CAIIGAT CAYO (Be slippery as an eel) which was the writing against Fr. Jose Rodriguez! The Friar immediately shouted to have the boys arrested but by the time the Guardia Civil arrived at the scene, the boys have dissappeared. It was said that the time and money which the Spanish Friars spent were all an exercise in futility for they never found out who wrote, published or distributed these pamphlets against Fr. Jose Rodriguez. After almost a hundred years, the original pamphlet that was written against Noli Me Tangere and Dr. Jose Rizal is being made available digitally. In this edition, you will find the original image scans, the Tagalog ebook and the English translation.